Thank you for joining me as we count down to the next MFT release. We are just two days away from the big day! All the new Stamps, Die-namics, and Stencils will be available on Tuesday, September 16th at 10:00pm EST. Be sure to check out the MFT Blog to see all the new items being revealed today. Don't forget to leave a comment on the MFT Blog Countdown posts, YOU could win one of the seven $75.00 gift vouchers. The card I have to share with you today is my favourite of all the cards I designed for this release. I love this card for a couple of reason, I absolutely love fall colours and this card is full of them. The other reason is that it expresses gratitude, something that fills my heart every day. I created the background with the previously released Horizontal Strips Die-namics. I love that these dies were designed specifically to give you different matching options to fill a full card front. For this card, I chose to use five of the same sized strips die-cut in a variety of autumn colours. I placed the Out on a Limb Tree on the left side of the card front. Once again, I used a template to line up the leaves. I created a hill using one of the Snow Drifts die. The hill helped to hide the bottom of the tree trunk, which allows the gorgeous sentiment to stand out. The Words of Gratitude Die-namics is so amazing! I can't tell you how much I love this set! The thin script style is fabulous! 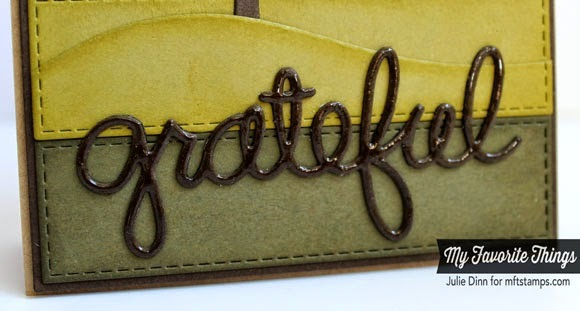 For this card, I die-cut the word gratitude in Chocolate Brown card stock and I added a thick layer of Crystal Effects to it. 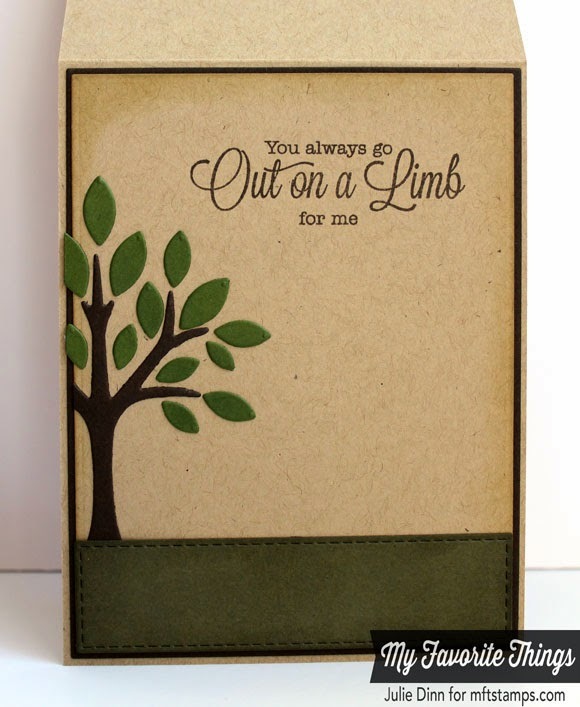 On the inside of the card, I added a sentiment from the Out on a Limb stamp set and a partial Out on a Limb Tree. Don't forget to check out the MFT Blog to see all the gorgeous the MFT Design Team has to share with you today. I'll be back again tomorrow with one final look at the new products before the New Release and the New Product Launch Tour. Wonderful card! The colors are beautiful and the tree is lovely! I love the hill and the glossy sentiment. Thank you for the inspiration. Love the different colored panels and how you made a landscape from the hill and tree. Great card. Awesome card! Love the panels in all the great fall colors! Oh my gosh. I may stare at this one all day long. It is just absolulely beautiful. Took my breath away for a sec. Gorgeous color combo, and I very much like how you did the Snow Drift cut in the same color. Subtle but definitely there. Crystal Effects sure did 'up the ante'. Beautifully done, Julie. Julie, you take something simple and make it outstanding with your eye for detail! The curve of the hill where the tree is, the crystal effects on the word grateful -- the steady hand that applied it! It's the added touch that makes your cards over the top. I love the ombre panels and the stitching, of course, but I would not have thought of the hill effect or the crystal effects on my own and that's why I am so GRATEFUL for you; that you share your creativity and ideas with us. 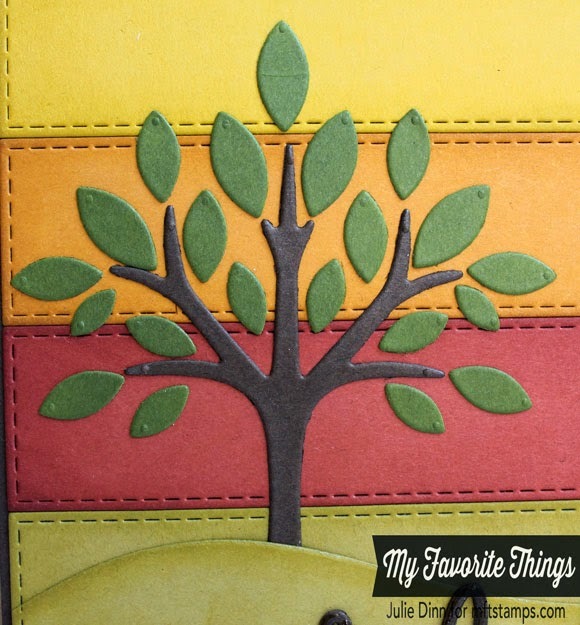 Really love this card with the colors combo and the little hill you created....so cute!! i like your colored paper strips. definitely a winning card. I saw this in the SCS gallery today and just Had to stop to get a closer look. This is just beautiful. 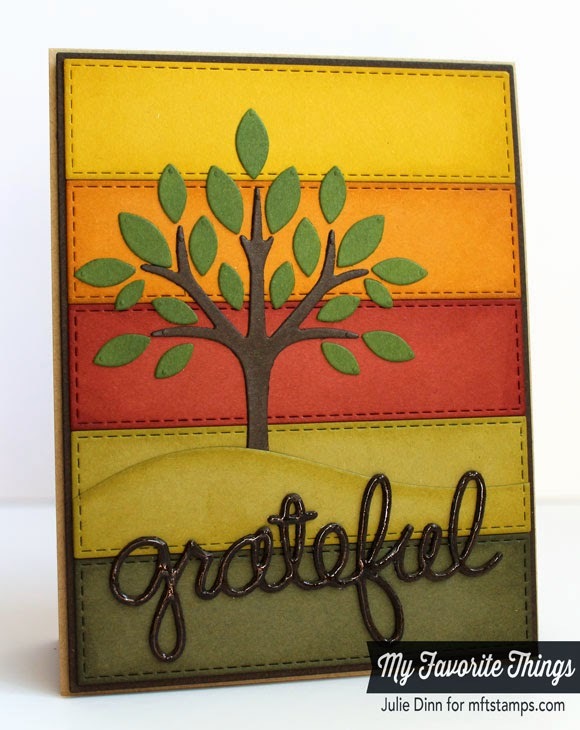 I love Autumn colors and the giant Grateful dies are super. This looks like you drizzled chocolate on the word. Love the card, colors, and design!! Can't wait to get my hands on out on a limb!! SHUT UP!!!!!!!! Love these, and those fall colours! I love these colors and the wonderful hill and the sentiment on the inside! Just really fabulous! TFS!